Baby rashes are common and usually nothing serious. Rashes may appear on the face or head due to normal conditions, such as cradle cap or milia. A red rash on the baby's buttocks is likely diaper rash. A red rash on other areas of the body, like the stomach, that develops right after eating is more likely a reaction to food; however, that is not the only possibility, so consult your pediatrician. 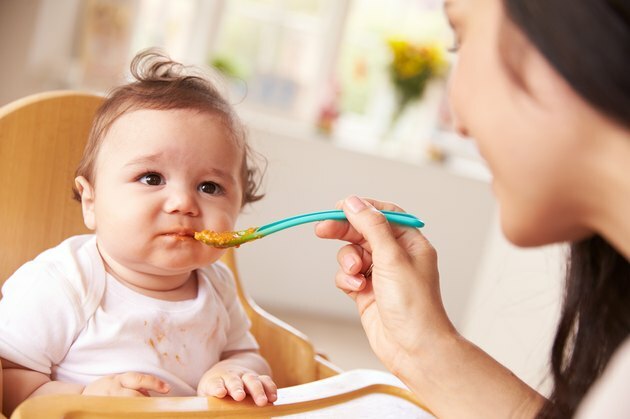 Feeding your baby something he is allergic to could cause a rash on the stomach. A food allergy is when the immune system reacts after eating a particular food. Some 6 to 8 percent of children younger than 5 years old are estimated to have food allergies, according to the Mayo Clinic. Even a tiny amount of the food can cause a serious reaction. A skin rash called hives is a common symptom. Digestive problems and swollen airways are other possible adverse reactions. A food allergy may also cause anaphylaxis, which is a life-threatening allergic reaction. Reactions to food can also occur in breastfed babies. If you eat a food that your baby is allergic to and then breastfeed, your baby may experience a rash, wheezing, cold-like symptoms, fussiness, constipation, vomiting, diarrhea and itchy eyes. Your baby may also sleep little and wake up displaying signs of discomfort, such as upset stomach. Symptoms may appear four hours after feeding, or up to 24 hours afterward. A rash on the stomach is unlikely to happen from formula feeding, but formula may cause a red rash to appear on the face or buttocks, according to Drugs.com. Hives may be a reaction to food, but that is not the only potential cause. Hive bumps can show up on the face or body as a reaction to medicine or from an infection. Hives, also known as nettle rash or urticaria, can appear as red, itchy and swollen spots on the skin that vary in size and shape. A cool compress may relieve itching, but consult your doctor for the best treatment recommendations. If your child has food allergies, it is likely that he may also have eczema. Baby eczema appears as red, scaly and itchy skin. Sometimes, eczema causes fluid to ooze out of patches on the skin. These patches may crust over if scratched. Eczema may be a symptom of a food allergy. An irritant like a rough fabric rubbing against your baby's stomach could also cause a rash there. Dry skin or a bubble bath are other potential causes for baby eczema.